Didn't we just have another Cities Skylines expansion this spring or summer? Yep, we sure did. Mass Transit released only five months earlier (May 18th)! Heck, there was also another, tiny DLC pack released later in the summer as well. I didn't pick up the Concerts DLC. At $7 (more than half the price of a full DLC), I just didn't feel like it was a very good value if all it does is add the ability to make an outdoor concert venue. If the Concerts DLC had been a full-fledged expansion that focused on planning and managing city events, that might actually have been pretty cool. I actually would have been totally on board with a full expansion focused around building arenas, stadiums, convention centers, festival spaces, and so forth; then managing the traffic going into and out of them; and inviting concerts, sporting events, music festivals, trade shows, and maybe even political rallies or the Olympic games to your city. Unfortunately, the scope of Concerts is about the same as the Match Day DLC, which Colossal Order were kind enough to give away for free. Maybe I'll pick up Concerts if it goes on sale for $3 or $4. Mass Transit, on the other hand, was a full expansion, and might very well have been the best expansion for Skylines to date. While the previous expansions were focused on adding additional flavor and customization to your city, Mass Transit actually took a stab at providing more utilitarian solutions to one of the most endemic problems that your burgeoning cities will inevitably face: traffic congestion. It was pretty successful at that mission. Green Cities aims to solve any pollution problems your larger cities may be suffering from. Green Cities tries to follow suit. Except instead of helping to solve your traffic woes, it offers new tools for addressing the second most significant and intractable problem your cities will ever have: pollution. 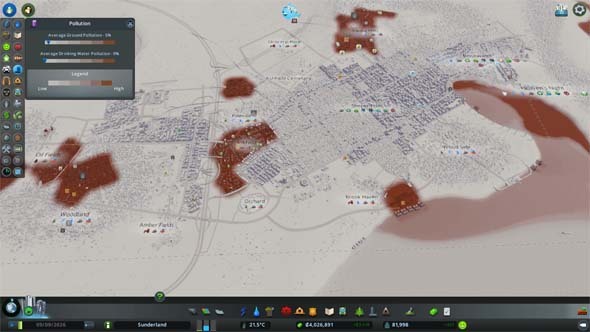 I'll admit that I never really had much of a problem with pollution in my Cities: Skylines cities to begin with. Thus, I haven't really found Green Cities to be as useful as it seems to think it should be. I usually only had a few blocks of default industry in my cities. I usually focus on lumber and farming once they become unlocked, and then go strictly with offices once those are unlocked. And even then, I rarely play a single city long enough to get it up into the millions of population. Maybe at that point, pollution is a critical issue, but for me air pollution has rarely been a problem. Smaller cities can see some benefit from the inclusion of things like the recycling center, which is available as early as the first milestone. It can apparently replace landfills in very small cities and seems to have less of a ground pollution footprint. I'm a bit annoyed that it doesn't seem to have any visual indicator of how full the building is. It would have been nice to have animations of the building filling up with junk and processing it, but whatever. 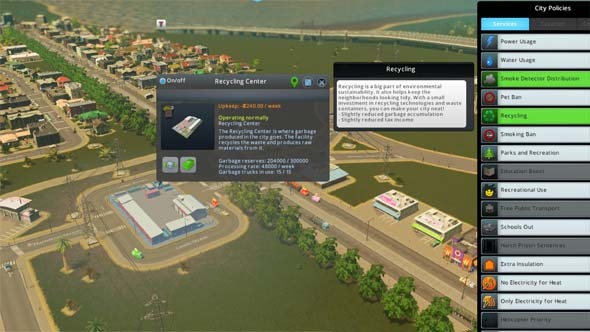 The "Recycling" policy is still its own thing (and is unlocked a couple milestones later), and I'll admit I'm not sure how (or if) the recycling center building and the recycling policy interact with one another. I guess the recycling center actually acts as garbage storage and converts some trash into consumable goods, whereas the policy only reduces the amount of garbage that the city generates. There's also an "Plastic Recycling" policy that simply improves the efficiency of the recycling center. Recycling centers are available very early as a substitute for landfills.